We’re experiencing a few technical difficulties with our shop. Since I’m just returning from a week in the woods with 16 girls ages 8-12, I’m not really ready to dive in and figure it all out. That and the fact that our amazing web guru Websy Daisy is taking a few days for some family time at the beach, means technology is being placed in the back seat. All good family reasons, right? If you’re really needing those workbooks before Monday, send an email to Bernadette and she’ll be happy to hook you up with whatever Slow Family guidance you need! And while you’re perusing for some ideas for family connection, Bernadette’s book co-written with Kathie Sever, is OUT ON THE BOOKSTORE SHELVES!!! Make Stuff Together is available to you right now chock full of ideas for some good creative family time. We received a sweet box in the mail the other day. Perfectly sized and illustrated with a sweet little manatee drawing. 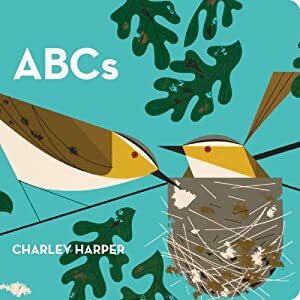 Inside were 3 beautiful board books with an outdoorsy theme – including one featuring illustrations by the amazing Charley Harper whose 1960s era science book artwork is getting some acclaim right now. The books were lovely and well received by our resident pre-schooler. But the box was kind of cool too. In order to bring back the old idea that the box is as much fun as the contents, this box came with “instructions” for use. Ideas for making robots or other fun box creations, corn starch packing peanuts that could be used for building and drawings to be colored in and used for the aforementioned box creations. The idea comes from Blue Manatee Boxes, a little independent bookstore in Ohio. Started by a pediatrician, the idea is a return to basics and the idea too that in this age of fast paced learning and high tech toys, what’s old, such as a cardboard box, can be new again. And used by kids for imaginative play. If you know of some household that could use a little creative inspiration, not to mention some really beautiful books which can be purchased by such themes as art, eco, baby, birthday or love, The Blue Manatee Boxes are pretty sweet. And might just inspire some good play on a hot summer day. And if you aren’t in the market for books right now, I hope this post inspires you to look at the next cardboard box you receive with a more imaginative eye. Have you seen this magazine? It’s one of my favorites by far. Sure it falls into the parenting category of magazines but it’s way more than any parenting mag I’ve ever read. It’s got good essays and fiction. Lots of humor. It always holds a good meaty feature story. And it’s got tidbits of newsworthy pieces pertinent to your role as parent. There are no how-tos such as top ten ways to get your child to sleep or to get them to eat. It holds no strong views on whether or not you should nurse or circumcise or co-sleep or vaccinate. Instead it’s just got really good writing. And thoughtful discussions. And funny cartoons. And, perhaps one of the greatest things, it arrives quarterly. That means you’ll have no pile-ups of unread issues or backlog of materials. You know how those monthly mags can sometimes go? You’ve finally picked up one and the next one is stuffed into your mailbox? With Brain,Child you’ll be super psyched when each issue arrives and if you’re smart, or lucky, or both, you’ll carve out a little solo mama reading time all to your very own so you can fully dive into each issue. Is it wrong that a parenting magazine makes you want to stop parenting in order to be able to fully digest each issue? Referred to as the magazine for thinking moms, it really is one of my favorite magazines of all time. And even if I’m not in total thinking mom mode, it can bring me there a lot faster. For the next week only Brain,Child is offering a special rate to Slow Family Living readers. Just $19.95 for one year and $34.00 for two years. Click here to get it while it’s hot. No limit on the number of subscriptions! Good for renewals AND gifts. That’s it! Now go get yourself an issue and you’ll be ready for the summer issue which will be out soon. Have I mentioned that I love this magazine? If you have been reading this site over the past couple of years you would know that we are big fans and proponents of allowing space in a child’s life for pure imaginative play. In imaginative play there is so much creativity and inspiration and development for those growing brains of our kids. Without ads, children can learn so much about themselves and the world they live in, without sway of billions and billions of dollars of commercial influence. Recently we were introduced to Pure Play Kids – a toy company started by Mike and Tania Grant who were on a quest to find the best possible playthings for their own kids. “After examining every aspect of the children’s products industry, it became clear that much was wrong with how children’s products are designed, manufactured, marketed, sold, used, and discarded in the United States. Pure Play Kids was formed to fundamentally improve the marketplace for children’s products and to provide parents with superior choices for raising their own families. Visit their website. Find out about their mission of providing beautiful products that are kinder to the world we live in. And read about the Living Room Impact test which states that Pure Play Products will look far better occupying all rooms of your house than will plastic toys! Check out the July/August issue of Mothering Magazine for an article of mine on allowing risk. It’s a fine line for parents and one that is sometimes hard to walk. And even harder sometimes to defend when others are there to watch and comment. And I love the photo of our giant steel slide – from hereonin referred to as our “monument to risk”. How could you not want to read about that? I am a co-founder of Slow Family Living but beyond that I am a writer. It was my writing actually that first inspired Carrie and I to collaborate. And from that collaboration came Slow Family. I often write about family life on my blog and cover such things as parenting four children, the funny points, the sweet points and the low points too. Before the blog there were the essays. Also many about family life but about life in general: past, present and future. Sometimes they get sent off to magazines and get printed such as one coming up in the July issue of Mothering Magazine. Other times they get sent off and then sent back only to sit idle in my computer. Just recently I started compiling them, very slowly I might add, to this other site of mine called Writerisms. (I collect blogs for a hobby) There is one essay I just put up that I thought might be pertinent to Slow Family readers. It’s called From Where I Sit. And it’s about the experience of meeting each child where they are. And recognizing too the fleeting nature of it all. There is definitely not a Slow Family stance on vaccines because we really believe families need to do what is right for them. We know however that it is a discussion that presents itself always when parents get together and discuss the health and well being of their children. And a dialogue that can often get heated as families decide what is right for their children and what is right for the community at large. It is a decision that often makes parents feel confused as to what to do. We just received an announcement from the producers of Frontline that their show The Vaccine Wars will be aired next Tuesday on PBS. Check out the preview and then participate in the dialogue on the Frontline website. It’s a heavy topic and will only get heavier if we’re not informed. Gever Tulley was here in Austin this weekend, as you may well know from me going on and on on my various blogs and sites. He is the founder of the Tinkering School, now a summer camp but one day soon perhaps a K-12. I was fortunate to share a stage with him and with Carrie Contey on Friday night and then participate in various workshops all weekend long. I am really going to try to take those words and that sentiment into my parenting. I am going to try to remember the collaborative part. Because really, since we’ve been around longer, we may know more about what already is, but we don’t know more about the ideas that have yet to be formed. (I am going to make this my new mantra.) I’m going to try to listen more and dictate less. I am going to trust that the mistakes are part of the process and that really, there is often more to be learned from the mistakes than from an easy success. So, though as parents we have a desire to “save” our kids from failing/falling/faltering, perhaps the very best thing we can do is to let them experience it on their own and from there give them the tools and support they need to figure out the solution. Gever wasn’t really speaking about parenting, but really he was. Slow Family Living is also in Rhythm of the Home, an online quarterly magazine celebrating warmth, celebration, play and connection for happy, creative, connected family life. In addition to the article about the whys and ways of slowing down, connecting and enjoying family life, there is a super sweet picture of my husband and son taken on a family camp out a few years ago.